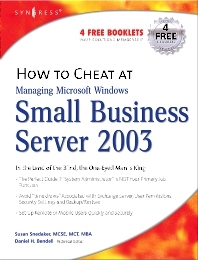 How to Cheat at Managing Windows Small Business Server 2003 deals only with the vital, and will be a huge relief to the hundreds of thousands of managers who probably never imagined they would be managing the operating system equivalent of the Space Shuttle. The "80/20" Rule applied to managing a Windows Small Business Server 2003 network. Concise coverage, with ready-to-use solutions, of the most commonly encountered W2K3 Server tasks and problems. Written for the non-MCSE, with little technical training, who is responsible for running a small to medium sized network. Microsoft has announced it will no longer support Windows NT 4 products, effective Dec. 31, 2004. Millions of small businesses that did not upgrade to Windows Server 2000 will choose to upgrade directly to Windows Server 2003, and this will be a timely book. Susan Snedaker, currently Director of IT and Information Security Officer at a large community hospital in Arizona, which has achieved HIMSS Analytics Stage 7 (EMR) certification and has been voted 100 Most Wired Hospitals two years in a row. Susan has over 20 years’ experience working in IT in both technical and executive positions including with Microsoft, Honeywell, and VirtualTeam Consulting. Her experience in executive roles has honed her extensive strategic and operational experience in managing data centers, core infrastructure, hardware, software and IT projects involving both small and large teams. Susan holds a Master’s degree in Business Administration (MBA) and a Bachelors degree in Management. She is a Certified Professional in Healthcare Information Management Systems (CPHIMS), Certified Information Security Manager (CISM), and was previously certified as a Microsoft Certified Systems Engineer (MCSE), a Microsoft Certified Trainer (MCT). Susan also holds a certificate in Advanced Project Management from Stanford University and an Executive Certificate in International Management from Thunderbird University’s Garvin School of International Management. She is the author of six books and numerous chapters on a variety of technical and IT subjects.